A new liveaboard for 2018, The Phinisi (also called Cheng I Sao) is an Indonesia Phinisi style sailing boat, built in 2007. 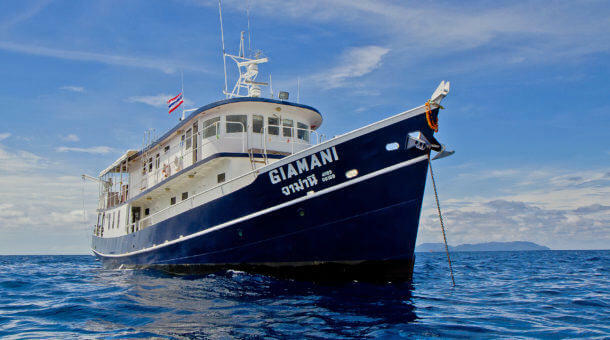 The Phinisi has been operating in Indonesia, the Maldives and Thailand, and now has a full schedule for Thailand and Myanmar for the 2018 - 19 season, Starting November 2019 the Phinisi will run incredible 10 night 'Best Of Thailand' cruises along with 10 night Myanmar cruises. A maximum of 18 guests are accommodated in 7 very nice cabins - 5 double or twin plus 2 lower budget quad cabins, all cabins with aircon and bathrooms. All cabins have private bathrooms and individual control air conditioning. You can choose double bed or twin bed cabins, or a lower budget 4 share quad cabin. the cabins are all on the lower deck with portholes. On the main deck you have a spacious airconditioned saloon where you can eat, relax, watch movies, prepare cameras etc … The dining area is forward of the saloon and is open air, but covered. On top of the boat is a large sun deck with sun beds and mattresses. This is a very comfortable boat for just 18 guests. 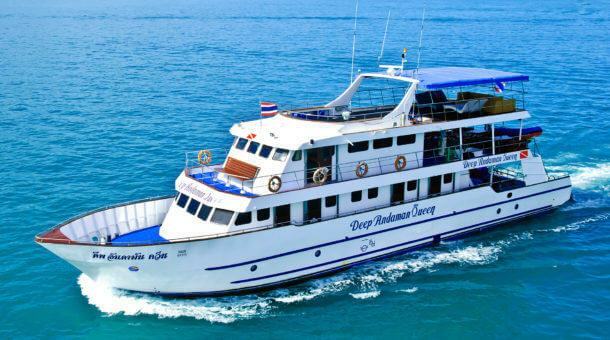 Rental equipment is provided by Sunrise Divers for our divers on The Phinisi. Rental price is 500 Baht per day for a set (BCD/regulator/fins/mask/wetsuit) and 250 Baht per day for a dive computer. We have a large equipment room at our dive center with 30 sets of Aqualung BCDs and regulators and a large selection of long and short wetsuits, open heel and full foot fins. Torches for night dives 3.50 USD per day. 15 liter tank available 10 USD per day. Nitrox is available on board @ 10 USD per tank or 25 USD per day for 12 liter tank fills. 15 liter extra 10 USD per day. PADI Advanced Open Water course is 280 USD. PADI Enriched Air (Nitrox) course is 200 USD. Drinking water, coffee, tea, sodas are included. Beers are 3.50 USD and wine 5 USD per glass. The Phinisi runs trips for 6 nights and 4 nights in Thailand, which can be combined into a 10 night trip and there are 7 night and 10 night trips in Myanmar. With many different trips and destinations, if you want details of any itinerary please do contact us, or we will send the itinerary along with any trip request.